The Story of “La Maison du Pastel” starts at the beginning of the 18th century, a time when working with pastels was very much in fashion. 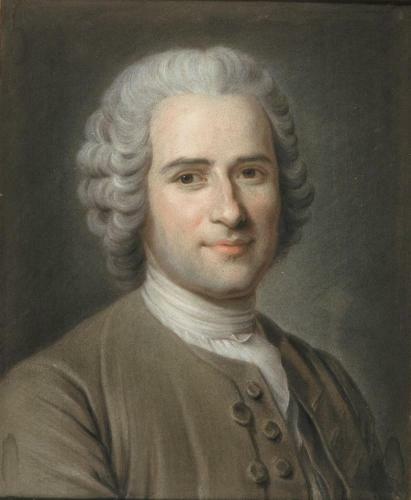 Artists such as Quentin de la Tour, Chardin and Rosalba Carriera contributed to its notoriety, and the pastels produced in Paris were renown throughout Europe. 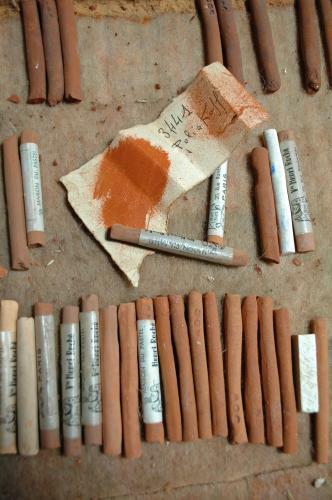 During a trip to France between 1720 and 1726, Rosalba noted in her correspondence that she favored the pastels that were offered in Paris. The workshop ancestor to "La Maison du Pastel" has existed since 1720. 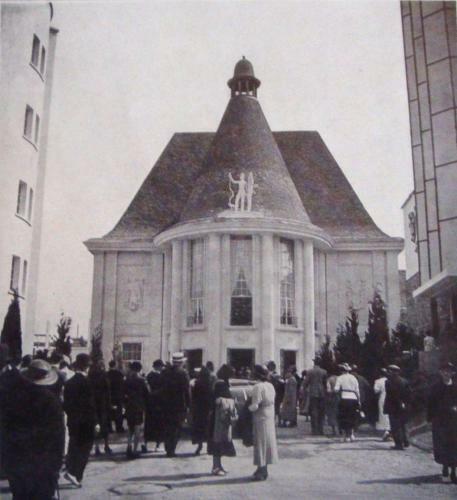 In 1760, it was situated in Versailles, until moving to the rue Saint-Honoré in Paris. 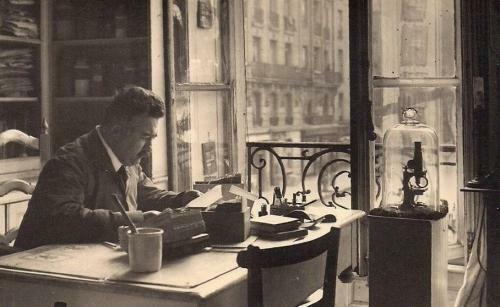 In 1766, it settled on the rue du Grenier St Lazare in the "Marais", the area of Paris dedicated at the time to commerce, where it remained until 1912. 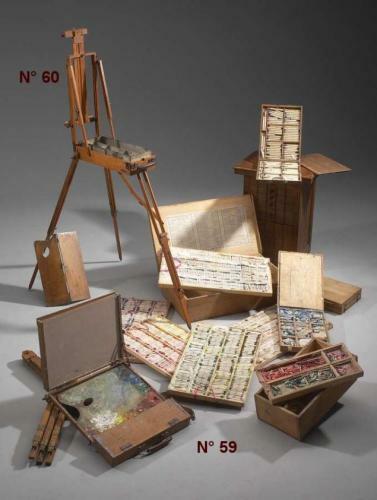 During the 19th century, this "Maison", named "Macle", dealt with all types of materials for artists, including drawing pencils, charcoal, and pastels. 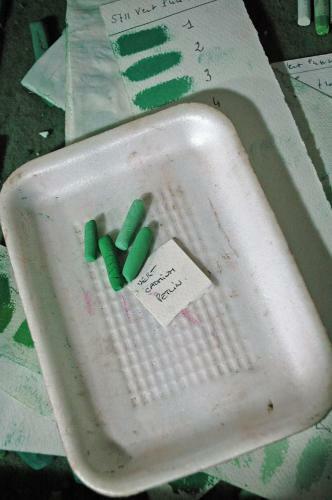 Around 1865, an old artisan was specialised in the manufacture of these pastels, which were of very high quality. 1865-1906: Henri Roché (father) takes over the "Maison"
Henri Roché, a chemical engineer, chemist, biologist, gold medallist of the "Société de Pharmacie" and of the "École de Pharmacie de Paris", was also very interested in art. He was furthermore a former student of Pasteur, who worked with pastel himself, and who presented Roché to the old artisan, with whom he began to work. Henri Roché became more and more interested in the activity at the rue Grenier St Lazare, and was tempted by the adventure of pastel, dreaming of making it a prime painting technique. 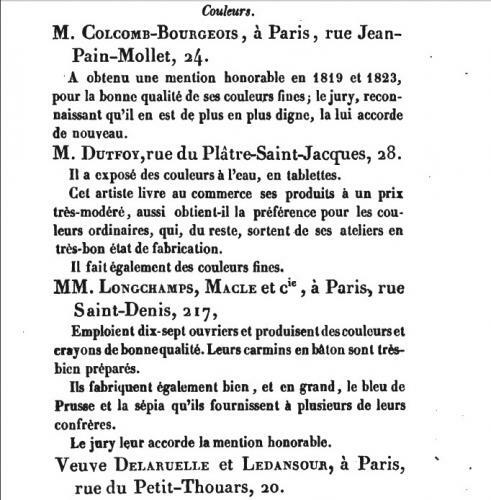 With his pharmacy having been prosperous, but not fulfilling his love for research, he decided to sell it and instead buy the old "Maison Macle". He worked in close collaboration with the old artisan, who shared with him his traditional skills, while Roché added a few scientific processes to the manufacture. 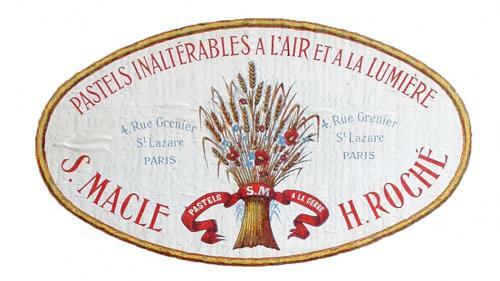 In 1878, Henri Roché took the head of what becomes "La Maison du Pastel." He developed regular contacts with Legros and Whistler in London, and then those such as Degas and Chéret, who submitted to him their desires regarding pastel: having a wide range of solid colours, varied, harmonious, luminous, and with an adherence to the support such that no fixative is needed. Eventually, Roché decided to abandon the sale of other artists’ material in order to dedicate himself entirely to pastel, developing from roughly 100 colours, a range of around 500 colours by 1887. 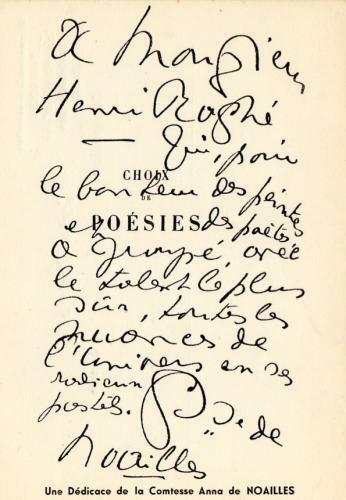 "To Mr. Henri Roché, who for the happiness of painters and poets, has grouped, with the most certain talent, all the world’s colours in his radiant pastels." 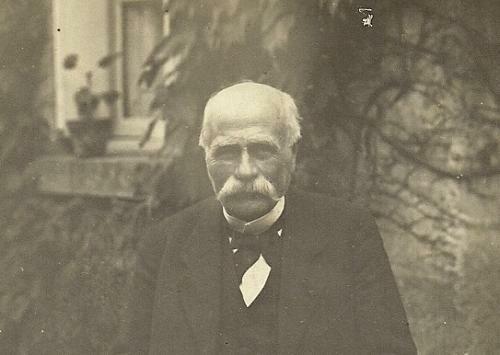 In 1906, the son of Henri Roché, Dr. Henri Roché (MD) started dividing his time between his medical practice and his father’s work and research. In 1912, the workshop was moved two blocks away from the rue Grenier St Lazare to the present shop address: 20, rue Rambuteau. There they had a large workshop, a laboratory, and a shop for the direct sale of pastels to artists. 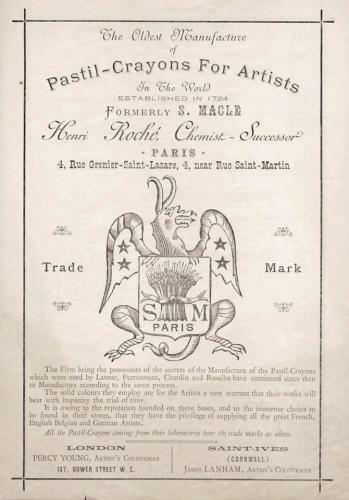 In addition to pastel manufacture, father and son published the « Cahiers de l’Artiste », a series of pamphlets touching the areas of interest to artists : fixation of pastel works, means of fighting mould, framing of pastel works, etc. By the eve of the first world war, the colour range had been widely diversified, with more than 1000 tints proposed to artists. As Dr. Henri Roché was mobilised between 1914 and 1920, the activity of the workshop was interrupted. When he returned in 1920, he continued sharing his time between his medical practice and his father’s workshop. 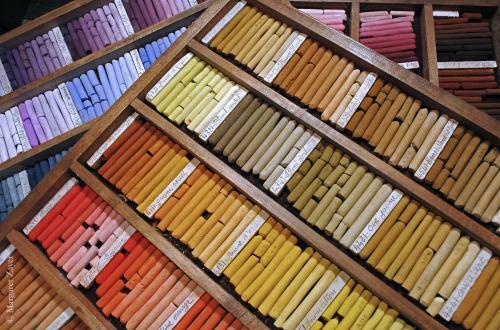 In 1925, his father, Henri Roché died at age 88, having dedicated the last weeks of his life to the pastels. 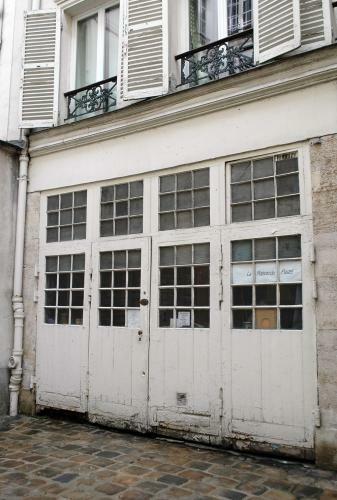 As the cost of keeping the workshop in central Paris became increasingly expensive, the laboratory and workshop were moved to the suburbs of Paris around 1930, leaving only the shop remaining, in the former garage at 20 rue Rambuteau. 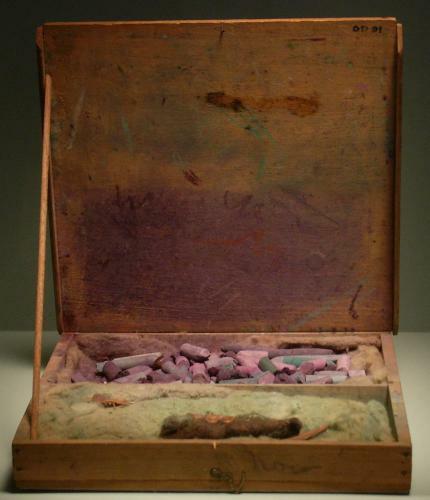 Dr. Roché’s frequent contacts with artists allowed him to further improve upon the quality of his pastels. This culminated in 1937, when he presented a range of 1650 colours at the Exposition Internationale de Paris (at the Pavillon d’Île de France), a collection that obtained the Gold Medal. 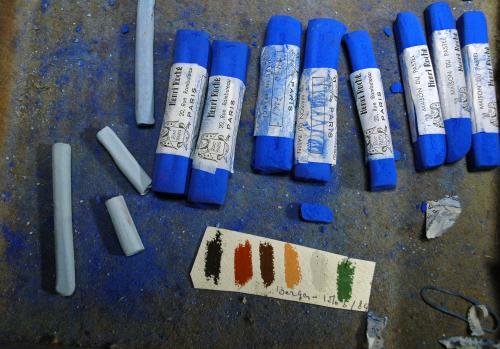 Dr Henri Roché’s passion for research also lead him to developing new products that were in connection with pastel. 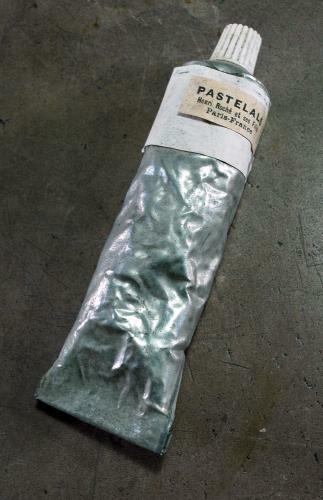 After ten years of research, « Pastelalo » was proposed to artists, a medium with similar properties to Roché pastels, that was neither gouache nor oil paint, but could easily be spread using a brush. It was intended as a base for pastel works, but was also used as a medium in itself. Additionally, various types of coated papers were proposed to artists, with a rough texture that was compatible with the use of pastels. The second world war put a complete stop to all activity. 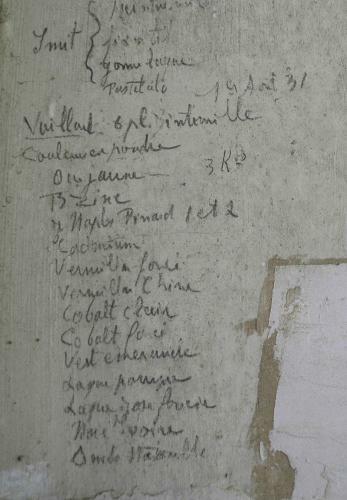 Between 1940 and 1945, Dr Henri Roché moved with his family to the south of France, and set up a small laboratory where he compiled and salvaged his most important documents. He managed to stay in contact with some of the artists, while taking up a medical practice. 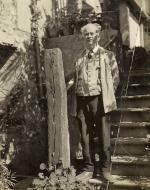 When he moved back home in 1946, the workshop had been looted, occupied by the Germans, and bombarded by the Allied Forces during Liberation. But in a burst of energy, despite his age and a weak health, he set back to work, taking up a medical practice in Eastern France to finance the restoration of the pastel activity, while his wife and their three daughters started up the workshop again. They were assisted by a German prisoner, Alfred Straub, who was assigned to their service for a year. 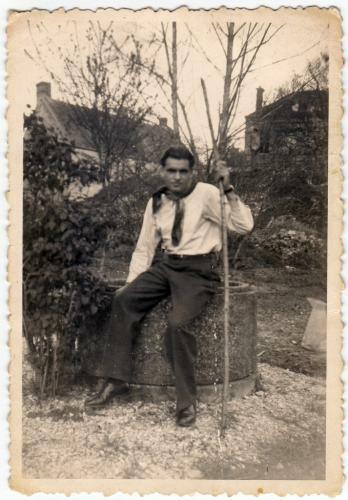 Having been very well treated by the family, he gratefully remained there an extra year, and has kept a close relationship to the Roché family to this day. 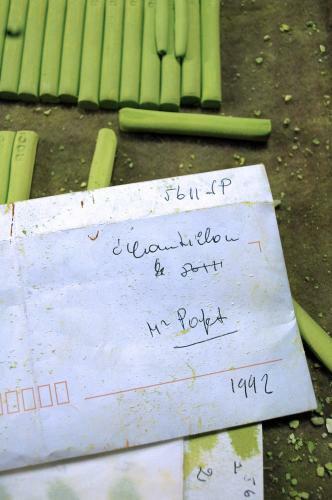 After Dr Henri Roché’s death in 1948, the skills and secrets of the pastel manufacturing were harboured by his wife and three daughters, Huberte, Denise, and Gisèle. When their mother died, the eldest, Huberte, a dignified woman with a profound devotion to "her" artists, took over as the head of La Maison du Pastel. Denise, a prolific artist in her own right, commanded the atelier with Gisele and Huberte. Around this time, a new generation of artists brought a new light to the pastel medium: Serge Poliakoff, Jacques Aubelle, François Barbâtre, Claude Bauret-Allard, Pierre Boncompain, Roseline Granet, Catherine Hekking, Jean Le Gac, Pierre-Edouard Maussion, Irving Petlin, Yves Popet, Pierre Skira, and Sam Szafran, to name a few. The sisters maintained an allegiance to these artists, even as they grew older and their health declined. And certain artists grew a strong allegiance to them. 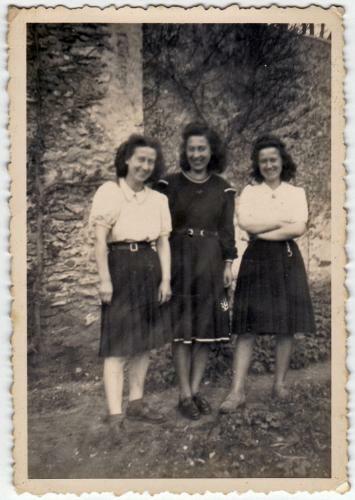 Sam Szafran, whose loyalty and unconditional love of Roché pasels, as necessary tools and inspiration for his work, supported the three sisters as the Maison hit difficult times beginning in the 1980s. At this time, they began a contact with distant cousins, Marc and Françoise Roché, whom they met at a family reunion. By the turn of the new millenium, the Maison had nearly come to a halt. 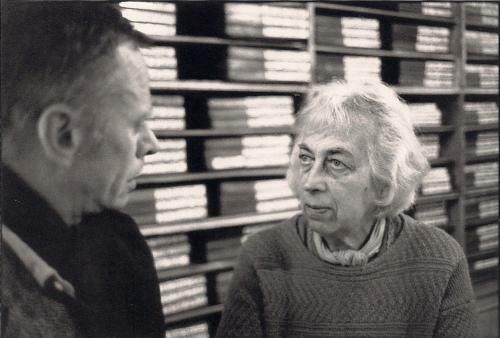 Towards the end of the 1990s, the sisters were in their eighties and all but Huberte had abandoned the fabrication of the pastels. The stocks dwindled, and it became clear that they needed to find a successor soon, or the legacy of the pastels would be lost. 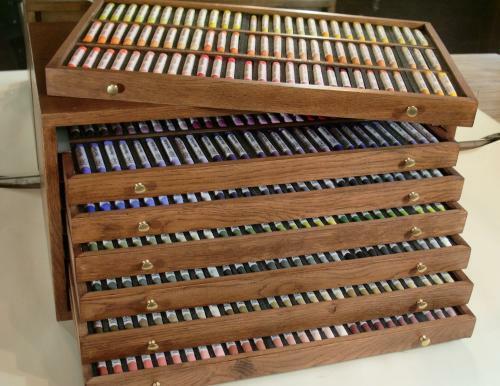 Huberte once again turned to Marc and Françoise, who began delivering pastels to her artists. 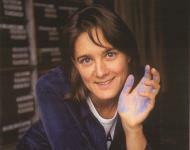 In 1999, Isabelle Roché, daughter of Marc and Françoise, is a young engineer working in the petroleum industry. 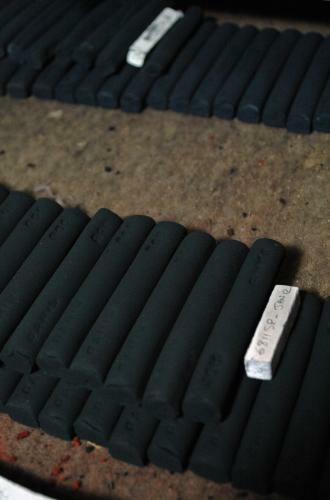 As she bears witness to her parents’ negotiations with Huberte, she slowly becomes fascinated by the history of the company and of the pastels, and marvels at the variety and beauty of their colours. After Huberte passes away in November 1999, Isabelle decides to quit her profession, and after further discussions with Denise and Gisele, she officially takes over La Maison du Pastel in May 2000. In the beginning, she is instructed in the art of the fabrication by Denise (Gisele passes away in 2003), assisted in the atelier by her father, and cheered by a few handfuls of loyal and eager clients. Within two years, she brings the range up to around 300 colours, and by 2007, she manages to sustain a range of 567 on her own. After ten years of working alone, Isabelle decides to accept the assistance of a young American student, Margaret Zayer, who is looking for a meaningful experience in the summer of 2010. Having found her place at the atelier, and having developed a strong rapport with Isabelle, she returns during the winter, between her final semesters at college, and finally settles back in France with diploma in hand in July 2011. 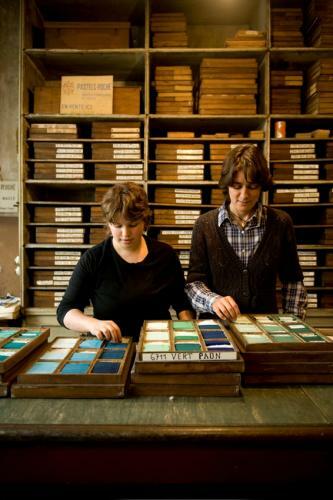 With a renewed energy, Isabelle and Margaret’s ambition is to slowly bring the Maison back to its original glory, having in mind and at heart, the ability to satisfy the needs of any artists who come to the boutique, with the colours and quality they require. They launch in 2012 the "Petits Roché", a limited range of half-sticks, and keep introducing new ranges, now formulated entirely by Margaret. The collection, as of Janvier 1st, 2017, consists of 1201 nuances. © 2019 La Maison du Pastel. All rights reserved. 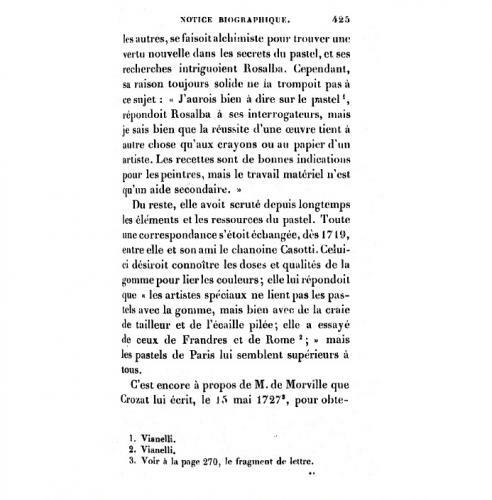 Version française. Design and development : Antoine Leblond.